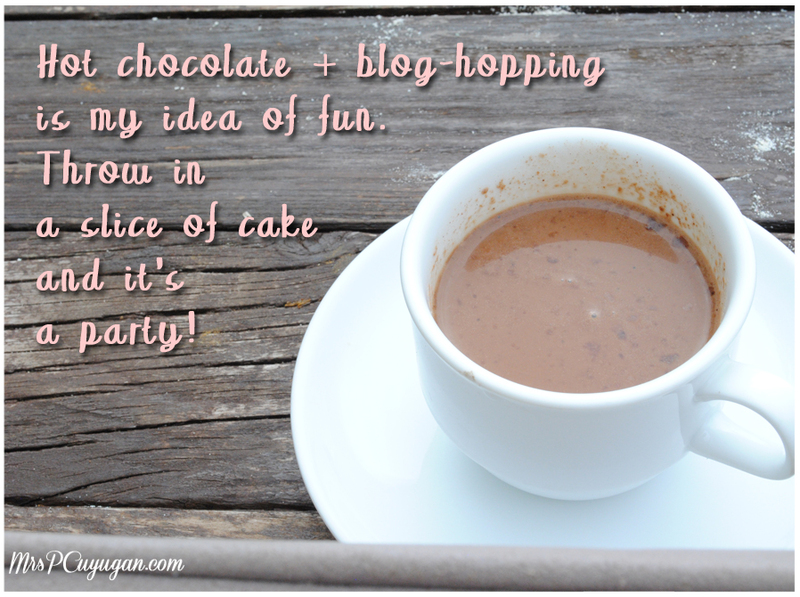 I blog-hop a lot. Ever since I started actively blogging myself, my love for reading blogs has grown steadily. While I love discovering new blogs to read, I do have my list of faves. These are the ones I go to regularly to check if there are any new posts. I comment as often as I can, but sometimes it can be fun to also just lurk and read. Haha. So anyway, here are my seven current fave blog-hop stops, in no particular order. Joei and I have been blogging friends since college I think. We’re also friends in real life, and that makes things more fun. She and I share a common love for food and for kaartehan. Whenever I am in search of new places to try, or if I want to know if a particular restaurant is good,I check out Joei’s blog. Joei and Me is the only one on my list that is not a mom blog. Janice is one of my first mom blogger friends. She is also one of my first WAHM friends. She and I chat like we’ve been friends for ages, when in reality we’ve only known each other for a little over a year. That for me is the stuff great friendships are made of – an instant connection that grows stronger as you learn more about the other person. I love reading her blog because the little bits and pieces of her life as a mom and a super woman totally fascinate me. I love how updated we are with each others’ lives, just like sisters, and our blogs play a big role in our being connected with each other. Make it Blissful (formerly Dainty Mom) and Martine are important to me because this was the blog that unknowingly empowered me to take the plunge and become a WAHM. This blog for me is so real and so relateable, that it makes you want to go and do what you love, find your bliss, and chase your dreams. There’s an aspirational aspect to it, too. You see nice things, clean and well-designed spaces, ideas for better living, and you take those things and know that you want them for yourself so much that you go and get them. That’s why I love this site. Coz I’m boring like that. I’m pretty sure I met Cyn at a blogging workshop last year. Maybe it was Blog Inspired? Anyway, I love reading the mom and daughter adventures that she and her daughter post on this blog. It reminds me a lot of the time I would spend with my mom when I was a teenager, and until today, actually. There’s so much heart in this blog, and I think that’s why I like it. You get such a happy and inspiring vibe from the entries, and you can see how both women in this mom-daughter tandem are really making an effort to live their lives to the fullest. I don’t just love this blog. I love the blogger. Toni, I labyu! She likes books and video games. She’s quirky. She’s motherly. She admits that she’s not perfect, and yet she strives to be all that she can be amid the imperfection. She’s also really pretty hahaha. I met her at Blog Inspired when I was just a newbie mom blogger, and she really inspired me so much. It’s blogs like Wifely Steps that make me want to be a better blogger. Mish is my idol. Seriously! When I first met her, I thought she looked so young and fresh and pretty. I was surprised to learn that she had 4 kids. She certainly doesn’t look it. She’s a great writer too, something that I aspire to be. She cooks and bakes, she crafts, she teaches yoga and is super fit. Yes, I sound like I’m fan-girling, but she’s actually my friend and we’re practically neighbors. She has an amazing little girl, Gelli who’s so much fun to be around. I ate cookies with her once, and we had fun, that little girl and I. I’ve learned a lot from Mish in the short time that I’ve known her, lots of lessons on being a mom and being a blogger, and little life tidbits, too. If I could make one blog-related wish, it would be for Marge to write more often. Bow. She has an amazing talent for storytelling that I believe she should share with all of us. Pressure much? Haha! So there you go, I hope you guys can check out these fab blogs too. And please share your favorite online reads in the comments. Include your own links, too, okay? Like I said, I’m always on the lookout for new blogs to read. Thanks for sharing these inspiring blogs! Hopping over and checking them. Aww hope I get to meet you soon, too! 🙂 I always love meeting new mommy bloggers, both online and in real life. Thanks for these reads. I have known more than half from your list but have not met the bloggers personally. I still feel I know them though. Hehe. I also visit Roller Coaster Ride and Make It Bliss. I’ll visit the Wifely Steps one of these days. I love reading your blog!!! 🙂 Hugs! I haven’t heard of any of these blogs yet, but I’m always looking for new ones to follow/read. I might check them out.